Terriers returned to the winning column with a 4-2 home win against Vermont Friday night. After a scoreless first period, BU took the lead when Danny O’Regan converted passes from Robbie Baillargeon and Cason Hohmann early in the middle period. UVM promptly tied the score on a power play goal by Mario Puskarich. But the Terriers regained the lead when Matt Lane (photo) sniped his fifth goal of the year from the right circle and extended it to two when Ahti Oksanen blasted his fourth on a power play. 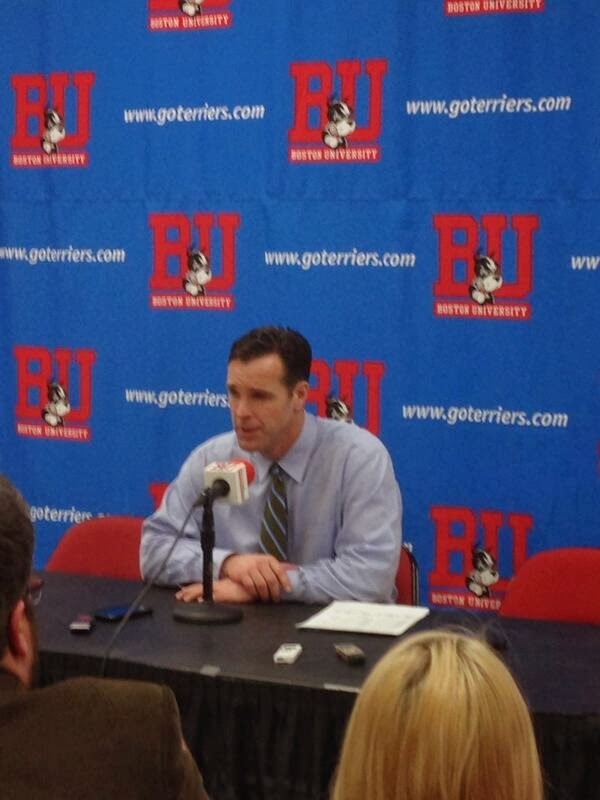 BU took four penalties in the third period and the Cats’s Colin Markison converted one of them to cut the lead to one. BU killed the last of the penalties and then Nick Roberto, who assisted on Lane’s and Oksanen’s goal, iced the contest with an empty-netter in the waning seconds. "I liked what we did on the 5-on-3. There was a lot of unpredictability, we were moving, we moved the puck quickly, we got some shots and obviously Ahti makes a great play on the goal. Great pass too. ►Freshman Dillon Lawrence won eight of nine faceoffs. ► It's a quick turnaround for BU and Vermont with the second game of the series starting at 4 p.m. on Saturday. It airs live on NESN. Terriers continue to add size and skill on the blueline with the verbal commitment from Jersey Hitmen right-shot defenseman Ori Abramson. The 6-3, 215 lb., Toronto native had originally enrolled at Providence College in 2012 but left after developing an illness. Following half a season with OJHLTrenton, in which he registered 20 points in 35 games, Abramson joined the Hitmen and currently has a 3-15-18 line with 36 PIMs in 30 games. He played in this past Monday’s USPHL-Premier Division All-Star Game at Merrimack College. A rugged defender with offensive skills as well, he was a recent USPHL defensive player of the week and, according to JerseyHitmen.net, “scored this seasons highlight reel goal ripping a puck shortside after beating a Whalers attacker with a spin-o-rama.” Abramson, a 2011 Ontario Scholar, has significantly improved his skating over recent years to prepare for NCAA D1 hockey. USHR reports that Northeastern also sought his services. 2014 recruit Jack Eichel broke a 2-2 tie early in the third period, scoring his 22nd goal of the season, as the NTDP U18s defeated Youngstown, 4-2. Eichel, whose 15-game point-scoring streak had ended last weekend, also added an assist and has 42 points in 27 games. The Phantoms had taken an early lead on 2014 recruit J.J. Piccinich’s league-leading 11th power play goal. The right wing from New Jersey has a 20-16-36 line in 35 games. 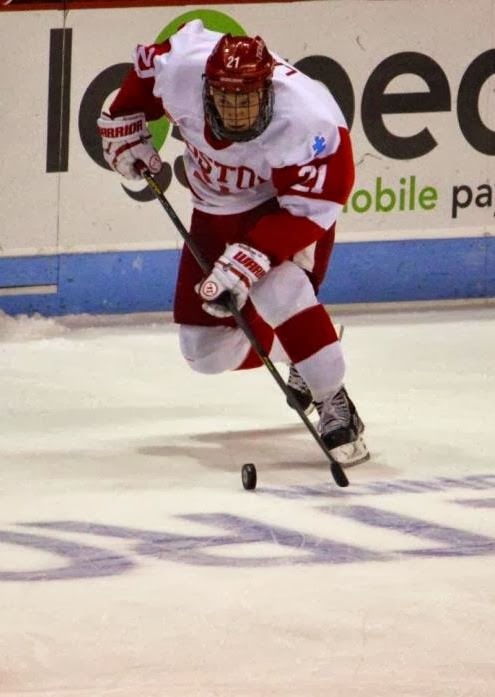 The game featured four future Terriers with 2015 recruit Maxim Letunov playing center for Youngstown and Johnathan MacLeod on the U18s' blueline. Wade Megan scored his fifth goal for San Antonio since his call-up from the ECHL, as the Rampage were edged by Iowa, 5-4. Ryan Whitney added an assist for San Antonio. The Terriers slump continued in Vermont as the host Catamounts came away with a 4-2 win in the first of a weekend pair. BU received goals from Kaleigh Fratkin and Louise Warren, the second knotting the score at two apiece. But the Catamounts scored twice in the final 90 seconds to salt away the win. The teams meet again on Saturday with a 4 p.m. start.